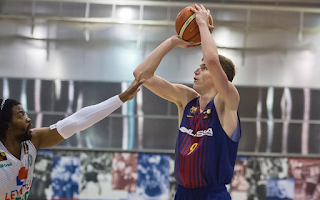 Luka Samanic is a 6-10 215 power forward with serious skill. He can shoot it from outside and he can take you to the basket with quickness. He can post you up and has the potential to be a good two-way player. 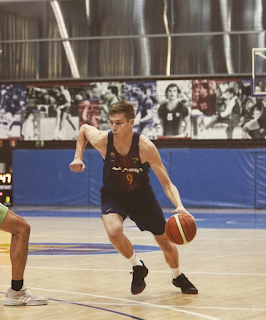 He is one of the top international players in his age group and is currently projected as the no.2 international prospect and the no.14th overall prospect in the 2019 NBA draft class and could move even higher. I had a conversation with him about his future. LJ: It's been great watching you develop. What part of your game allows you to make the most impact? Luka: Well I think it’s my shot and ability to run and move as a small forward at 6’11. LJ: What other top international players have you played against? What is the toughest international player you have played against? Luka: I played against top European players and also top USA players but I can’t decide or point at someone in particular. LJ: You are great in transition and your long range game is developing more. What part of your game is improving the most? Luka: My opinion is my body and overall game. Passing, shooting and, dribbling. LJ: Who is your favorite player in the NBA? Why? Luka: Kevin Durant because he is just so long but also quick which allows him to pass through opponents and he shoots really well. LJ: What will NBA scouts like about you the most? Luka: I think mix of my length and mobility. Luka: I played in FIBA U18 this past summer and since than I was on junior tournament in Tenerife. I was also in Junior Euro league tournament also. LJ: What team would you like to play for if you could pick an NBA team? Luka: Well my goal is to reach NBA, but if I have to choose maybe Knicks, Lakers, Boston. LJ: Have you ever thought about playing college ball in the U.S.? Luka: I did and it’s still an option. LJ: What NBA players have you played against? Luka: I never played in game but on practice I did. LJ: What makes you ready for the NBA level? LJ: We have you ranked as the no. 14th ranked player in the 2019 NBA draft class. Are you going to enter the 2019 NBA draft? Luka: My plan is to enter 2019. But you never know. LJ: Why would a team benefit from drafting you? What type of impact do you bring to a team? Luka: I will do whatever it takes to win. I can rebound, assist, and steal. My first option is not only to score so it’s not limitation. LJ: Can you impact your first year in the NBA?